I always look at cheesecakes & wondered how they get this cheesy look, feel & taste. Every day I come across very appetizing cheesecake recipes & ‘transport to heaven’ photos on google. My To Bake List mostly comprises of goodies for which either I do not have correct equipment or I do not have the courage to test my abilities. 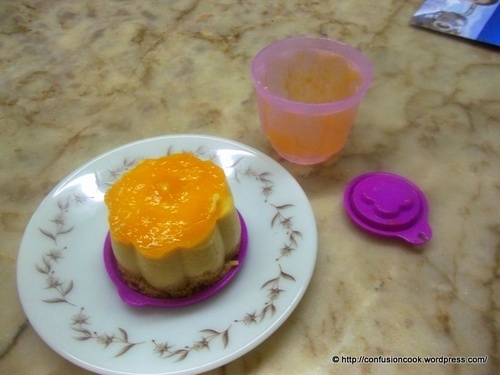 With a lot of apprehension and misgivings I chose to make Mango Cheesecake. I went for a tried & tested recipe by choosing from a blog. Anushruti of Divine Taste, blogs vegetarian recipes which she has created herself. Her recipes are perfect & snaps even better than perfect. :) Hop onto her blog for some more wonderful recipes. I didn’t want to make a very big cheesecake (always need to watch my weight ;) ) so reduced the quantity by half & used a loose bottom pan. I had little mixture leftover, so I used jelly moulds to set them individually. Place biscuits in a zip lock & crush using a rolling pin into powder. In a large mixing bowl, place butter & crushed biscuits. Using your hands rub in butter & biscuits together until well mixed. Place the mixture in a 6 inch loose bottom pan or springform pan. Press tightly to form a crust. Set in freezer for 1/2 hour. Meanwhile, soak china grass in 3/4 cup water for 10 mins until it becomes soft. In a processor run hung curd & paneer until smooth & creamy. Transfer it to a mixing bowl. In a heavy bottom sauce pan, heat mango puree over medium flame. Do not allow this to boil. In a separate sauce pan, place china grass & water mixture until it melts completely, about 5-6 mins. Do not allow this to boil. Once china grass melts completely, pour hot china grass solution into hot mango puree, stirring all the while. Slowly add the mango-china grass mixture to curd-paneer mixture. Stir in the sugar & vanilla extract and beat with a wire whisk until well blended. Pour this mixture over the prepared crust & allow to set in refrigerator for 3-4 hours. The sauce should be at room temperature. This was important for me as I was using preserved sauce from earlier recipe. Spread the sauce over the set cheesecake. Chill overnight in refrigerator for good setting or you can set in freezer for 2-3 hours. When set, slice & serve chilled. I served it to my brother-in-law and his friend. To say the truth, friend was completely taken with it, and brother-in-law was thoughtful with every bite. Till date I do not know, whether he liked it or hated it. 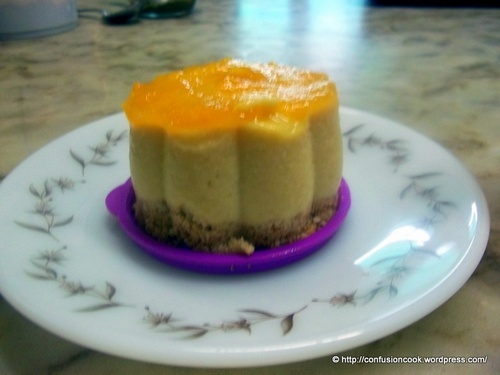 :) I personally loved it but I guess my family was not very ready for this creamy cheesecake especially no-bake version as my sister kept prodding me to bake it which I refused to do. In hindsight, I feel I should have done then atleast they would have enjoyed it. So on my To Bake List, I add a Baked Cheesecake. I had to serve this cheesecake to guests who were almost running outdoors towards their car and hence couldn’t wait for the sauce to set properly – you can see my sauce it still slightly loose on top. It was perfect when I cut a slice from it next day. Sending this to Mango Event hosted by Dr. Shameena of My Culinary Creations. Visit the site for some very interesting recipes.